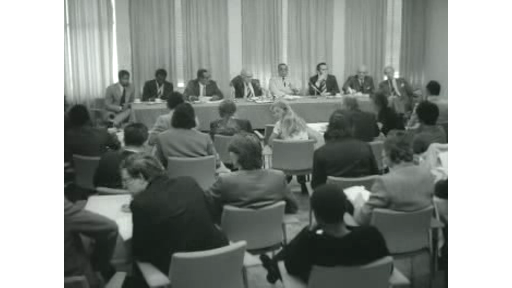 In the Catshuis in The Hague the Prime Ministers and other members of cabinet from the Netherlands, Suriname and the Netherlands Antilles started a conference on the request of the Suriname Government of Prime Minister Henk Arron to make this part of the overseas territory independent. The last election for the States in Suriname in 1973 ended in a victory for the Nationale Partij Kombinatie (National Party Combination, NPK) of Arron, who had made a powerful plea for independence. Outside the Catshuis are demonstrations by advocates and opponents of the independence. Short REACTIONS of two opponents of the independence. STATEMENTS by Prime Ministers Arron of Suriname, Juancho Evertz of the Netherlands Antilles and Joop den Uyl of the Netherlands. SHOTS: - Prime Ministers and members of cabinet sitting at the table in the Catshuis; protest march of independence advocates, who listen to speeches; journalists at a press conference. ARCHIVE MATERIAL: election posters with photo's of the candidates of the NPK; NPK supporters celebrating after the victory at the elections.